Marking the seventh straight record-setting month this year, Audi is reporting the company's best-ever July U.S. sales figures. Helping fuel the month's record sales was notable demand for the all-new, 2012 Audi A6 which counted 1,014 vehicles sold (a 64% increase over the same period last year). Continued strong demand was also reported for the all-new, 2012 A7 Sportback with 709 vehicles sold in July. Full report after the jump. HERNDON, Va., Aug 1, 2011 - Audi of America today reported record July U.S. sales of 9,146 luxury vehicles, topping the previous record of 7,974 vehicles sold in July 2001. July 2011 also marked the seventh consecutive month of record-setting sales for the brand in the U.S. market. 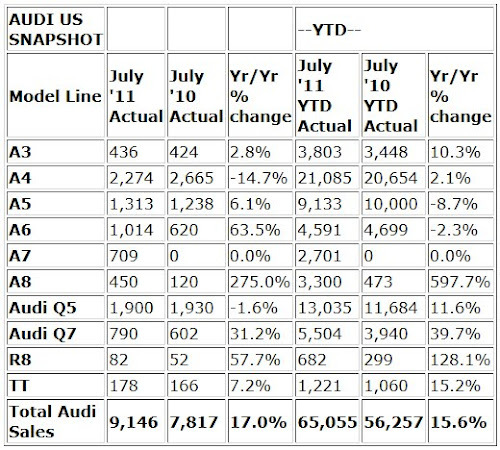 Year to date, Audi sales in the U.S. grew 15.6% to 65,055 luxury vehicles sold from January 2011 through July 2011. 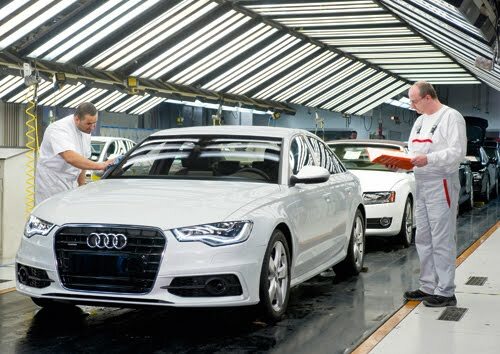 The favorable Audi performance in July was led by significant consumer demand for the all-new 2012 A6 with 1,014 vehicles sold, a 64% increase over July 2010. The all-new A6 features Audi’s industry-leading navigation and safety technology, including MMI® Navigation plus with Google Earth, Audi connect with wireless internet access and Night Vision Assistant with thermal imaging. Sales of the design-forward 2012 Audi A7, introduced this spring, remained strong with 709 vehicles sold in July, showing that premium car buyers are responding to the stylish, technologically advanced model. Sales of the popular Audi Q7 full-size luxury sport-utility vehicle increased 31% YOY to 790 vehicles sold, when compared to July 2010. The Audi Q7 TDI clean diesel model accounted for 36% of the sales mix in the lineup. Demand remained strong for the fuel efficient Audi A3, with 436 vehicles sold in July 2011. As consumers continued to show preferences for efficiency, the Audi A3 TDI clean diesel model accounted for 54% of the total A3 sales mix for the month. Sales of the Audi R8 supercar series climbed 57.7% with 82 vehicles sold in July. Year-to-date, R8 sales rose 128.1% with 682 vehicles sold in 2011. Sales of the sporty Audi TT model increased 7.2% from a year earlier with 178 vehicles sold in July, while TT sales year-to-date increased 15.2% to 1,221 vehicles sold. The western and the southern regions were the strongest gainers, with year-to-date sales in the south jumping 14% to 15,591 and in the west 11% to 16,460 vehicles sold. For the record-setting month of July 2011, Audi recorded year-over-year sales increases with seven of its models: the Audi A3, the Audi A5, the Audi A6, the Audi A8, the Audi Q7, the Audi R8 and the Audi TT. • New company record set in July with 9,146 vehicles sold, topping the previous record of 7,974 vehicles sold in July 2001. • Audi sales in the U.S. grew 15.6% to 65,055 luxury vehicles sold from January 2011 through July 2011. • Sales mix of the most premium models in the lineup (Audi A8, A7, A6, Q7) jumped to 32%, versus 18% in the same period last year. • Strong initial sales for the all-new 2012 A6 with 1,014 vehicles sold. • 2012 Audi A7 sustains momentum with 709 vehicles sold. • Audi A8 sales increase 275% YOY to 450 vehicles sold; YTD A8 sales up 597.7% to 3,300 vehicles sold. • Audi Q7 sales in July up 31.2% YOY and up 39.7% YTD, compared to 2010. • TDI clean diesel technology represented 54% of total A3 sales for July and 36% of total Q7 sales for July. • Audi R8 posted strong sales gains with an increase of 57.7% YOY to 82 vehicles sold in July; R8 sales up 128% YTD with 682 vehicles sold in 2011 through July. • Audi TT sales increased 7.2% from the same period last year to 178 vehicles sold in July 2011. • July CPO sales set fifth consecutive monthly record with 3,506 vehicles sold. • Audi CPO sales up around 26.8% versus 2010, the previous best July on record. • A4 models continue to make up the majority of the sales volume.